The dermal-epidermal junction also named cutaneous basement membrane zone is the acellular zone that is between the dermis and the epidermis . -* and also a fundamental role during the wound reepidermisation, by serving through its constitutive glycoproteins (mainly laminins) as a substrate for adhesion and migration of keratinocytes. -* the basal part of the basal epidermal cell membrane with in the keratinocyte, its specialised junctional structures, named hemidesmosomes; melanocytes and Merkel cells do not show hemidesmosomes; melanocytes exhibit focal adhesion systems and Merkel cells densifications of their plasma membrane in contact of the associated nerve end. -* the lamina lucida is a 20 to 40 nm thick and is traversed by anchoring filaments (5 to 7 nm in diameter) rich in laminin 332 (= laminin-5), and 311 (=laminin-6) and which interact with the extracellular domain of α6 β4 integrin at the cell surface of keratinocyte to form an adhesion structure with the hemidesmodomes. Between the hemidesmosomes, anchoring filaments are less abundant and their composition is different; it is the a3b1 integrin that is associated to the complex laminin 332-laminin 311 or 321. -* the lamina densa has a thickness which vary with age (30 to 60 nm) and is mainly composed of type IV collagen but contains also laminin 511(previously laminin-10) and 322 (previously laminin 7), nidogen , and heparan sulfate proteoglycans, a major one being perlecan . It constitutes the intermediate anchorage zone for the anchoring filaments originating from the epidermis and the anchoring fibrils issued from the fibrillar zone of the dermis. At the level of Merkel cells, the lamina densa fuses with the one which surrounds the nerve ends. The lamina densa is thicker in man than in woman while the lamina lucida has a similar thickness in both sexes. Lamina densa and lamina lucida are thinner under the melanocytes. -* the fibrillar zone includes the anchoring fibrils which are 20 to 60 nm thick , which enlarge at their extremities and have on their median part bands with an irregular periodicity , either dense and thick or clear and thin. The anchoring fibrils are composed of type VII collagen. They make the link between the lamina densa and the anchoring plaques of the papillary dermis or form intermingled loops which join two different areas of the lamina densa. Ultrastructural view of the dermal-epidermal junction in human skin. Recents studies show that the organisation of the dermal-epidermal junction might implicate contacts between the different constituents that would be closer that what was thought. Thus, the type VII of the anchoring fibrils might interact directly with the laminin-332 of the anchoring filaments. -* an internal plaque which is linked to the keratin intermediate filaments and which contains plectin and the antigen of the bullous pemphigoid with a 230 KDa molecular weight, named BP230. The carboxy-terminal ends of BP 230 and of plectin interact with keratin intermediate filaments (K5 and K14) and their amino-terminal ends associate with the cytoplasmic domain of BP180 and of the β4 integrin subunit. -* an external plaque close to the plasma membrane which contains the cytoplasmic part of BP180 and of the β4 integrin subunit, the two hemidesmosomal transmembrane proteins, and which contain also less characterised proteins, the protein P200 and IFAP 300. -* a sub-basal plaque, in the lamina lucida, which corresponds to the junction between the external parts of BP180 and of the β4 integrin subunit with laminin-332. 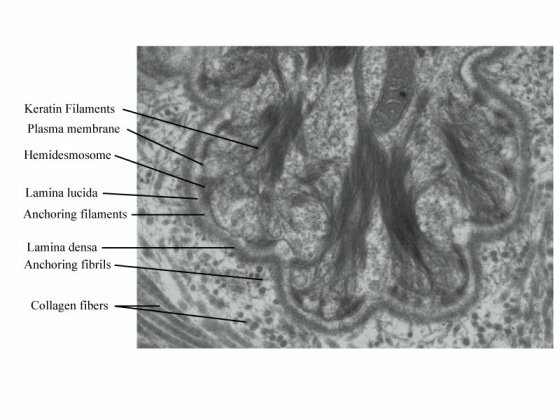 The anchoring filaments composed of laminin 332 and of the external part of BP 180, start from the sub-basal plaque, cross the lamina lucida and interact with the anchoring fibrils within the lamina densa. Schematic view of the dermal-epidermal junction organisation. 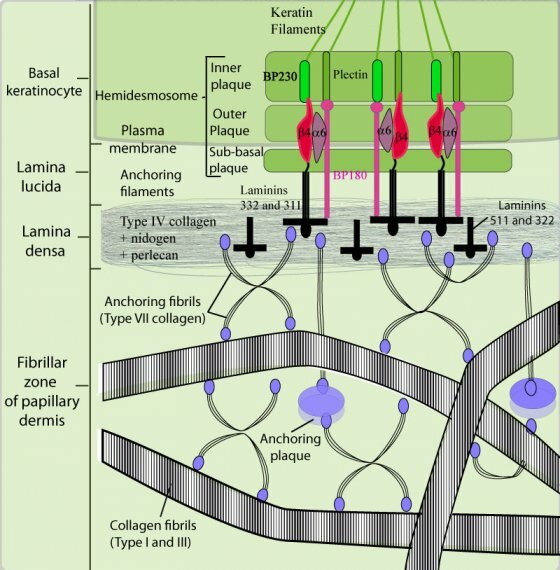 The adhesion of the epidermis to the dermis is made through the interactions between the keratin intermediate filaments (K5 and K14), the dense plaque (BPAG1 and plectin), the external plaque (integrins α6 β4, BP 180)and the sub-basal plaque (integrins α6 β4, BP 180, and laminin-332) of the hemidesmosome, the anchoring filaments (integrins α6 β4, BP 180, and laminin-332), lamina densa (type IV collagen, nidogen, perlecan, laminin 511 and 322), anchoring fibrils (type VII collagen), and collagen fibers (type I and III collagens) of the papillary dermis. Yes i m agree. Its interesting. en STRUCTURE AND FUNCTIONS Normal human skin structure Dermal-epidermal junction ?